Sadly neglected today, Frank Baker (1908-1983) was an intriguing and highly original author of fantasy and horror fiction, best known for his post-apocalyptic novel of an avian attack, The Birds (1936), which may have been an influence on Hitchcock’s film, and Miss Hargreaves(1940), a classic in which two young men invent a story about an unusual old woman only to discover that they have actually brought her to life. First published in 1983 and long unavailable, Stories of the Strange and Sinister collects ten of Baker’s short stories and displays the versatility of his work. Included are wonderfully macabre tales like ‘The Chocolate Box’, in which a discarded box found on a Cornish moor contains a gruesome surprise, and ‘In the Steam Room’, where a man enjoying a sauna believes he glimpses a horrible event through the steam, as well as more subtle tales of the fantastic like ‘My Lady Sweet, Arise’, in which a woman’s compulsion to sing ends with strange consequences, and ‘Quintin Claribel’, the story of a rude young man who must – quite literally – eat his words. This first-ever republication includes a new introduction by R. B. Russell. 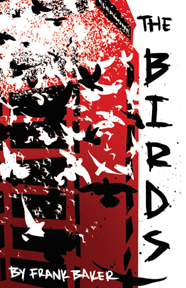 Frank Baker’s The Birds is also available from Valancourt. Frank Baker was born in London in 1908. From a young age, he had a deep interest in church music, serving as a chorister at Winchester Cathedral as a boy from 1919 to 1924. From 1924 to 1929, Baker worked as a marine insurance clerk in the City of London, an experience that he later fictionalized in The Birds (1936). He resigned in 1929 to take on secretarial work at an ecclesiastical music school where he hoped to make a career of music; during this time he also worked as a church organist. He soon abandoned his musical studies and went to St. Just, on the west coast of Cornwall, where he became organist of the village church and lived alone in a stone cottage. It was during this time that he began writing; his first novel, The Twisted Tree, was published in 1935 by Peter Davies after nine other publishers rejected it. It was well received by critics and prompted Baker to continue writing. In 1936, he published The Birds, which sold only about 300 copies and which its author described simply as “a failure.” Nonetheless, a year after the release of Alfred Hitchcock’s popular film of the same name in 1963, The Birds was reissued in paperback by Panther and received new attention. Baker’s most successful and enduring work was Miss Hargreaves (1940), a comic fantasy in which two young people invent a story about an elderly woman, only to find that their imagination has in fact brought her to life. During the Second World War, Baker became an actor and toured Britain before getting married in 1943 to Kathleen Lloyd, with whom he had three children. Baker continued to write, publishing more than a dozen more books, including Mr. Allenby Loses the Way (1945), Embers (1947), My Friend the Enemy (1948) and Talk of the Devil (1956). Baker died in Cornwall of cancer in 1983.